LONDON (Reuters) - Venezuela’s oil output sank to a new long-term low last month due to U.S. sanctions and blackouts, the country told OPEC, deepening the impact of a global production curb and further tightening supplies. Supply cuts by OPEC and partners led by Russia, plus involuntary reductions in Venezuela and Iran, have helped drive a 32 percent rally in crude prices this year, prompting pressure from U.S. President Donald Trump for the group to ease its market-supporting efforts. 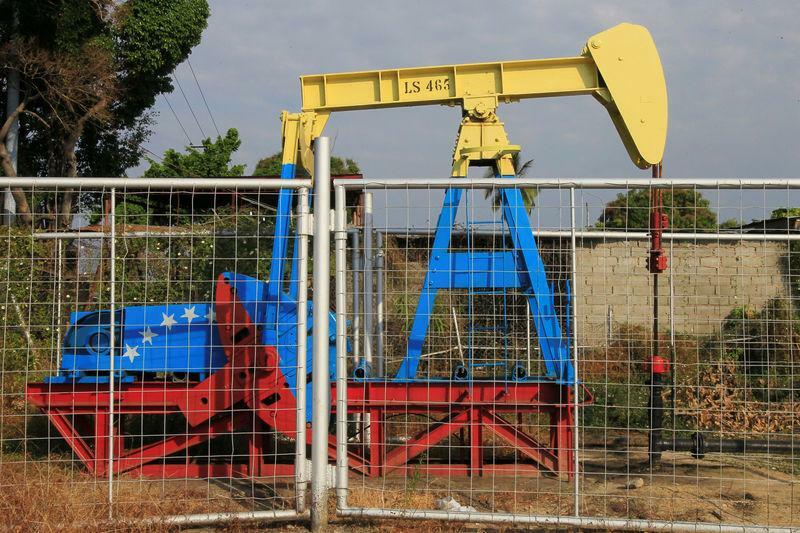 In a monthly report released on Wednesday, the Organization of the Petroleum Exporting Countries said Venezuela told the group that it pumped 960,000 barrels per day (bpd) in March, a drop of almost 500,000 bpd from February. The figures could add to a debate within the so-called OPEC+ group of producers on whether to maintain oil supply cuts beyond June. A Russian official indicated this week Moscow wanted to pump more, although OPEC has been saying the curbs must remain. OPEC, Russia and other non-member producers are reducing output by 1.2 million bpd from Jan. 1 for six months. The producers are due to meet on June 25-26 to decide whether to extend the pact. One of the key Russian officials to foster the pact with OPEC, Kirill Dmitriev, signaled on Monday that Russia wanted to raise output when it meets OPEC in June because of improving market conditions and falling stockpiles. OPEC+ returned to supply cuts in 2019 out of concern that slowing economic growth and demand would lead to a new supply glut. OPEC’s report said the economic backdrop was weakening and lowered its estimate of global growth in demand by 30,000 bpd to 1.21 million bpd. “Newly available data has confirmed the recently observed downward trend in global economic activities,” the report said. Stocks in February exceeded the five-year average - a yardstick OPEC watches closely - by 7.5 million barrels, less than in January. The report suggests that if OPEC kept pumping at March’s rate it would slightly undersupply the world market in 2019, even with the lower demand outlook. Venezuela’s production figure brings its numbers closer to outside estimates, which have been saying the country’s economic collapse has taken a bigger toll on its oil industry. Output in Venezuela, once a top-three OPEC producer, has been declining for years due to economic collapse. In March, supply dropped due to U.S. sanctions on state oil company PDVSA designed to oust President Nicolas Maduro, and power blackouts. Venezuela, plus Iran and Libya, were exempted from making voluntary curbs under the OPEC+ deal, on the basis that their output would probably fall anyway. OPEC’s share of the cut is 800,000 bpd from in most cases October 2018 levels, and other figures in the report showed producers were removing far more than agreed. The group uses two sets of figures to monitor its output — figures provided by each country and by secondary sources that include industry media. This is a legacy of old disputes over how much countries were really pumping. Overall OPEC output fell by a further 534,000 bpd to 30.022 million bpd, according to the secondary-source figures. This was led not by Venezuela but by Saudi Arabia, which has voluntarily cut supply by more than it agreed to support the market. As a result, the 11 OPEC members required to cut output achieved 155 percent compliance in March with pledged curbs, according to a Reuters calculation, up from February. OPEC estimates that it needs to provide an average of 30.30 million bpd in 2019 to balance the market, a figure lowered by 160,000 bpd month-on-month partly due to weaker demand. Even so, the report indicates there will be a small 2019 deficit if OPEC keeps pumping at March’s rate of just over 30 million bpd and other things remain equal. Last month’s report had indicated a small surplus.